The TCP Code calls on Code compliance monitor Communications Compliance to establish TCP Code enforcement arrangements for cooperation with other compliance stakeholders, including ACMA, Last week, CommCom and ACMA exchanged a Memorandum of Understanding that describes how the two organisations expect to work together. Central to the document are the timelines for CommCom to report Code non-compliance to ACMA and ACMA’s responses. the MOU first calls on CommCom to contact the provider and request compliance. By 30 July each year, CommCom will provide ACMA with a list of telcos that have lodged their Compliance Attestation, Customer Information Compliance Statement and (if required) Statement of Independent Assessment. If a telco fails to lodge required documents, CommCom may issue a written warning (the Code actually says warnings), and must notify the telco’s details to ACMA no later than 20 days after the telco has failed to respond. This implies that CommCom written warnings must specify a ‘respond by’ date, otherwise there’s no certainty about when a telco has ‘failed’ to respond, and when the 20 day time limit starts. 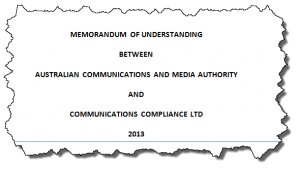 If a telco fails to respond to a Compliance Monitoring Request from CommCom, the monitor is obliged under the MOU to report the fact to ACMA within 30 days. 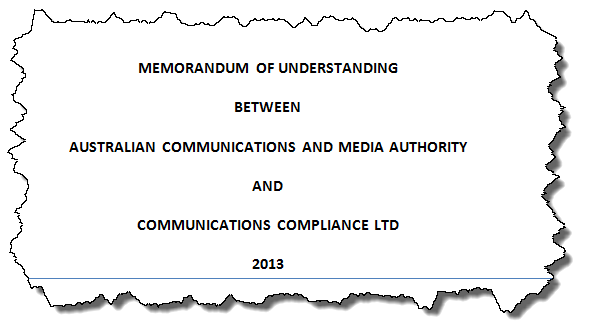 Oddly, this element of the MOU ignores the TCP Code’s direction that there are to be no reports to ACMA without ‘prior written warnings being given to the Supplier and the Supplier being afforded an opportunity to provide the required compliance information’. The TCP Code requires a telco that isn’t able to lodge its annual documents (because it doesn’t yet comply with the Code) to lodge a ‘Compliance Achievement Plan’ (CAP). If CommCom isn’t satisfied with progress under a CAP, it may issue a written warning, must report the matter to ACMA within 20 days after the telco fails to respond. A telco that gets caught out by a Compliance Monitoring Request can be required to lodge a remedial Action Plan. If CommCom isn’t satisfied with progress under an AP, it may issue a written warning, and must then report the matter to ACMA within 30 days. Again oddly, the MOU doesn’t reflect the TCP Code’s position that unsatisfactory progress with an Action Plan should only be reported to ACMA if CommCom has issued a warning and is then not satisfied that the progress against the Action Plan is being rapidly remedied. Presumably, that’s how the MOU will work in practice. ACMA will try to complete referred investigations within 60 days. Unless there’s a legal problem with publishing the result of an investigation, ACMA will report it on its website within 14 days. It’s useful that telcos now have indicative timelines around TCP Code action by CommCom and ACMA but it must be remembered that the MOU doesn’t really limit what either body can do in case of a real issue. Serious non-compliance can jump the investigation and enforcement queue. This entry was posted in Code Enforcement, Communications Compliance Ltd and tagged ACMA, Action Plan, Compliance Achievement Plan, Compliance Attestation, enforcement. Bookmark the permalink.